Pop quiz: what’s the difference between the two x-y graphs below? The answer is that they’re same graph — but the first picture above, we’ve zoomed in on one side of the bell curve. In the book How Not To Be Wrong: A Guide To Mathematical Thinking, author Jordan Ellenberg points out that if you focus on a small part of a curve, it looks rather a lot like a line. Human like lines because they’re easy to understand. Plot some data and draw a line, and you have visual evidence that more of this produces more of that, or that more of this results in less of that. 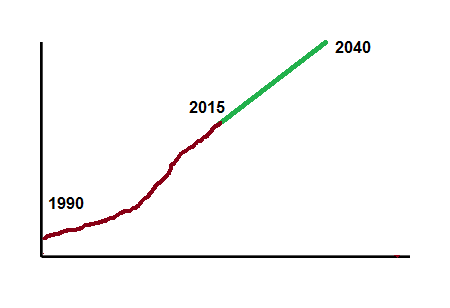 If the x-axis represents a span of time, you can even predict what the data will look like years from now by extending the line into the future. 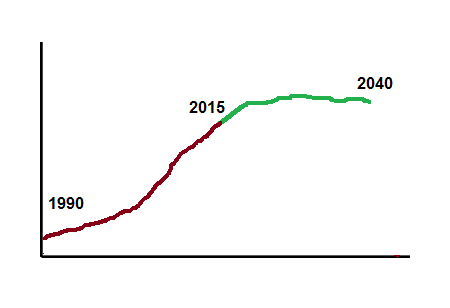 The trouble is, real life tends to be more curved and less tidy than our beloved trendlines would have us believe. Two variables that were happily holding hands and running uphill together on our chart can suddenly break up and go their separate ways. So the trendline flattens out or reverses direction completely. That’s often how real life is, and if we don’t want to be wrong (as the title of the book says), we shouldn’t assume that a trendline heading in a particular direction will continue in that direction forever. Trendlines can flatten out. It happens all the time. It’s what we see when the law of diminishing returns kicks in. If I’ve been lifting weights once per month and switch to twice per month, I’ll likely become stronger. Kick it up to once per week and I’ll probably become stronger again. But at some point, more frequent workouts won’t make me stronger. There’s a limit to how quickly a body can produce new, stronger muscle cells. Trendlines can also rise and then fall, producing a bell curve. More of this means more of that up to a point, but then even more of this leads to less of that. Interestingly (at least for those of us who enjoy reading about economics), Ellenberg introduces the concept by writing about taxes and the revenues they produce. Higher tax rates always produce higher revenues and therefore more government goodies for all – no matter how high the rates go. People have less disposable income to buy goods and services, which means fewer people will be employed to provide them. More people decide to participate in the underground economy to avoid high taxes. Fewer people can save the capital to start a new business. People who already have the capital to start a new business decide they won’t bother if they’re taking all the risks but Uncle Sam is going to take most of the reward. People in the highest income brackets often quit working for the year once any additional income they earn is taxed at a rate they find unacceptable. Again, Ellenberg doesn’t advocate for a particular tax rate. He simply points out that in any given set of economic circumstances, there’s going to be a rate far greater than 0% and far less than 100% that produces the most revenue. 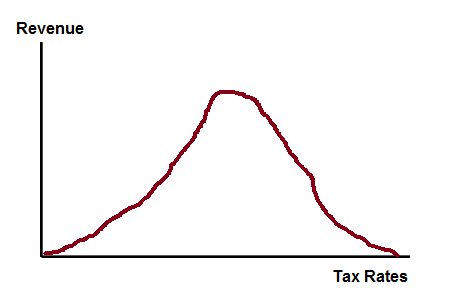 If we only focus on the left side of the curve, we’ll end up believing that higher rates always produce more revenue. If we only focus on the right side of the curve, we’ll end up believing that lower rates always produce more revenue. Both beliefs are wrong – and of course, the title of the book is How Not To Be Wrong. 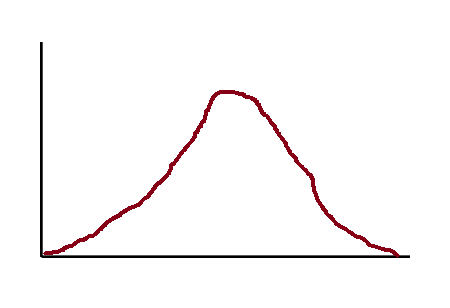 One way to avoid being wrong is to understand that in real life, the relationship between this-and-that often takes the form of a bell curve. Starting from a low level, more of something may be good … but that doesn’t necessarily mean a LOT more is better. Starting at a high level, less of something might also be good … but that doesn’t mean zero is better. Starting from a low level, more is better. But that doesn’t necessarily mean a LOT more is better. At some point, a LOT more is toxic. How much protein should you eat? We know too little is bad for your health. You’ll lose muscle mass and your immune system will weaken. But too much can cause diarrhea and dehydration. 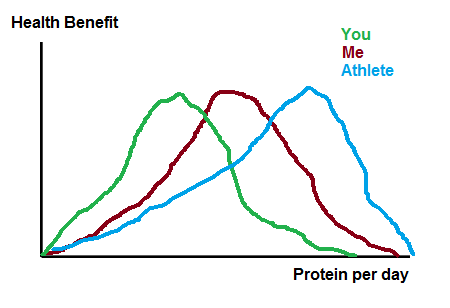 So the relationship between protein and health is a bell curve. Less is better, period. Sometimes that’s the reality. Chareva’s mother is highly allergic to walnuts. So for her at least, the walnut-to-health relationship would look very much like the rat poison-to-health relationship above. 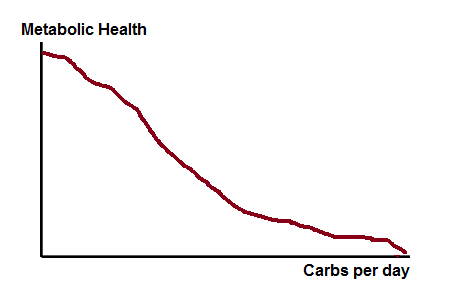 Metabolic health is the highest at close to zero carbs, then goes down from there. I believed that because I went from a high-carb diet to a low-carb diet, and my health dramatically improved. So for awhile, I figured if low is good, close to zero must be even better. It may be true for some people, but it’s clearly not true for everyone. On the low-carb cruise, I was pleased to hear Dr. Justin Marchiagiani respond to a question about ketogenic diets by saying he doesn’t recommend them for everyone. He works with each patient to find his or her ideal carbohydrate intake, which will depend on a number of factors. For some, it’s 50 grams per day or less; others feel better and lose weight more easily at 100 grams per day or more. He said he feels at his best at between 75 and 100 grams per day. That’s about where I am now as well. If we only focus on the right side of the curve, we’ll end up believing that more carbs always means worse metabolic health, so the ideal level of carb intake is close to zero. But that ignores the left side of the curve. And that’s an easy way to be wrong. Yup, that’s a result of the “what works for me has to work for you” mentality. How do you find a doctor as enlightened as Dr. Marchiagiani? Good question. I guess you have to interview doctors like they’re job candidates. And to get a good doctor you may have to pay directly, so that you and not the insurance company is the customer. And isn’t this just what Dr. Atkins actually proposed? Drastically reduce carb intake (generally <20 grams) and then slowly increase until weight loss stops, then back down a bit until weight loss resumes at a reasonable pace? I realize that is simplifying quite a bit, but I'm just illustrating that Dr. Marchiagiani is right in line with what Dr. Atkins advocated, and that apparently, Dr. Atkins' findings are still applicable. That is indeed what Atkins recommended. But as I’m sure you’ve noticed on the cruises, there are those who think we should all stay in the induction phase forever to stay in ketosis forever. As much as I don’t miss breads and pastas, I don’t really miss kiwi or applesauce either, and I loved both! Most days I just want eggs, meat and a protein shake…and that is it. Another example is the “linear no-threshold” hypothesis of the effects of radiation on health. At levels that actually do cause ill health effects (which levels are a lot higher than most people undrstand), it’s true that ten times the dose will cause ten times the risk. The assumption has been that this line goes all the way down to zero, and that you have to get to zero dose to get zero effect. But hat’s purely an extrapolation, and the real data for the effects of very low doses gets drowned out by the noise of other factors that affect health. In fact, a somewhat controversial theory known as “radiation hormesis” posits that some low doses are actually beneficial. But the result of the LNT hypothesis has been “better safe than sorry” policies that establish very low regulatory limits on radiation exposure that are far below levels that are actually known to be harmful, and an unnecessary and often hysterical fear in the public mind of anything to do with radiation — medical treatment, security scanning, food irradiation, and of course, nuclear power generation. Yup, people can get freaked out over ridiculously low levels of toxins and such that their bodies have no trouble handling. I have a friend who has to eat only organic food. But he eats wheat. And it’s probably organic semi-dwarf wheat created in a lab. And in totally inappropriate ways. For example, no coal plant would be allowed to operate under the guidelines for nukes for radioactives released by orders of magnitude IIRC. Not to mention the mercury and other heavy metals released by burning coal don’t decay but remain in the biosphere until buried by subduction. Perhaps after Homer the Sap is extinct, a new sapient species will arise maybe from raccoons and we should not poison their world. There are mineral radon water resorts. I was treated with mineral radon baths in Pyatigorsk (Caucasus) for eczema. The result was outstanding. The effect didn’t last forever, of course, but several months of remission was wonderful. Nowadays I just avoid wheat, but it is nice to know there are more options than a diet or steroids. recently, i talked w/ my neighbor in our annual block party who had a stroke almost an year ago. he sleeps 12 hours/day & still feel tired all the time. he suspects it may be a side effect. (statin seems to become the “standard protocol” for any cardio event… + he has switched to the “standard healthy diet” (i saw him having veggie burgers) (he eats fish only, no sweets, low salt, low fat, i.e. ascetic diet). 600 mg twice per day?!! Oh. My. God. after my neighbor complained about lethargy. So now the dose is merely outrageous. And then the data behind the curve has to be accurate. 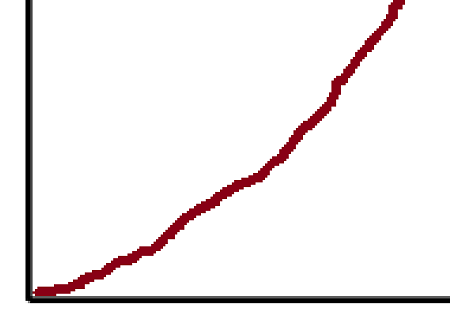 The hockey stick graph makes global warmers look like they have to fudge the numbers to make their political point. Then they take every news event, including shark attacks, and blame it on global warming. Talk about focusing on a point in the curve. Now even when it gets colder it is blamed on global warming. Huh? P.S. Love the Laffer curve! If excessive rain causes flooding, that’s global warming. If there’s a drought, that’s also global warming. If we see a record-warm day or two in summer, that’s global warming. If there’s a string of record-cold days in winter, that’s also global warming. That is why they should have call it climate change from the beginning. Well, they called it “global warming” when they predicting a constant rise in temperature. When the temperature didn’t cooperate, they had to re-name the brand. Actually, I notice a lot of people calling it global climate change or some sort of thing, rather than global warming. A lot of people have realized that global warming is not the universal term they thought it was! Anyway, great post, Tom! I have, once again, forwarded this one to the friend in the UK after the last two I forwarded. Yesterday, I received a forward from him from the London Sunday Times: “nutritionists (a word I’ve learned to hate) in the UK and Sweden have done exhaustive studies and found that coconut oil is not what it’s touted to be. It is not that good for you- other oils are better. Coconut oil raises cholesterol, etc., etc.” You were right- my last forward fell on deaf ears! The article does not state “what” exhaustive studies, where, with how many subjects, controls, etc. In fact, the STUPID article doesn’t really say who made the study! But of course, my friend takes this as gospel. A big SIGH….. I do wish the tipping point would hurry up! That’s what I expected. 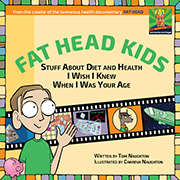 Anti-saturated-fat hysteria is akin to a religion for some. Thank you SO MUCH for posting this! While I’m a writer and not particularly good at math, even “I” can see that fudging the numbers is not good science. I think this whole notion of “everyone needs to be ultra low carb” or “induction levels forever” turns off a lot of people to the whole low carb idea, when many people can benefit from carb reduction, but at different levels. I tried a low carb diet (written by a chef – DUH!) that said to keep net carbs at 20 grams every day. I was always, always tired and I’m in my 30’s! Someone like me with more muscle tone (but still too much fat) needs closer to 100 net grams a day to be healthy and energetic. This notion of “one low carb size fits all” is just dumb and wildly inaccurate. 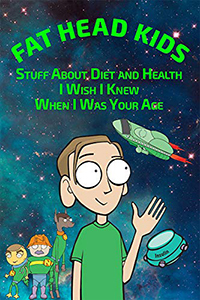 I wish someone would publish a book about general low carb information and encourage people to find THEIR own optimal carb levels. Those books are out there. The Primal Blueprint, the Perfect Health Diet, etc. Low carb but not VLC. Just to point out the Heath/RatPoisonIntake graph is completely wrong for many folk : who would be absolutely uneqiuvocally DEAD without warfarin. Our friend Jim Steel just keeps on trucking at age 90 which is twenty years since he started taking the poison. No way normally thick blood would get pumped by that knackered heart of his. 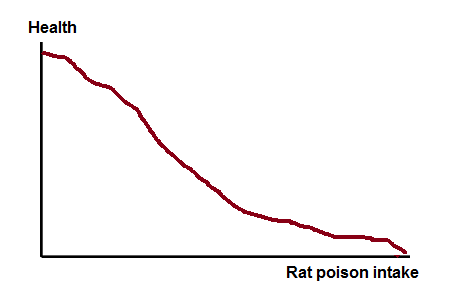 re: Warfarin is rat poison? Anti-coagulants aren’t the only form of rodent poison, but they are #1. This an issue where the authorized carnivorous life forms on your property (cats, dogs, pigs, and yes, chickens) might come across a carcass (not to mention eat the bait themselves). Indeed it is…. Used widely in Europe, much safer than its predecessor, arsenic. At a certain dose, it causes hemorrhages…. 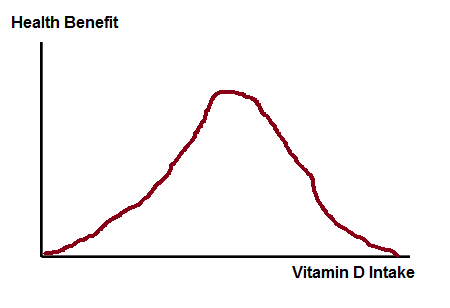 In case anyone was wondering, that U-shaped Vitamin D intake curve is a real thing, although it’s not intake that matters, but 25-hydroxy vitamin D levels in the blood, aka 25(OH)D.
Dr. “Wheat Belly” Davis, for example, suggests that the curve peaks at 60-70 ng/ml, and note that this is considerably higher than consensus recommendations. Once again, people need to be their own case managers, research and decide. Blood level also doesn’t correlate to any single specific intake, much less specific supplement intake, although most people trying to optimize end up taking 4000 to 8000 IU per day. If you are young (under 40) and get lots of sun, you may very well internally make a big portion of what you need. Many foods are Vitamin D sources as well. I see that “home” test kits for D level are available, although it looks like you still have to send a sample to a lab. 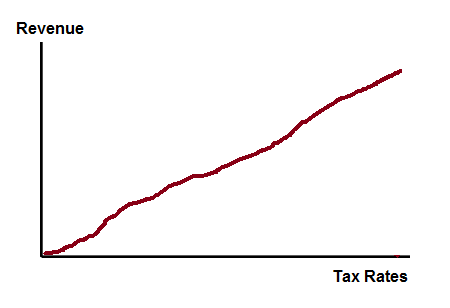 I recently finished off Basic Economics by Thomas Sowell, and he articulated poignantly how the highly dramatized capital gains tax rate cut under President Bush actually resulted in increased revenue. I wish that were the textbook in high school and college introductory economics courses. They’ll never teach that in public schools. On that final Metabolic Health vs. Carb intake, I would argue that the left sides of the peaks are more likely to be close to flat lines, and not descend into in MH deterioration. That would mean “0 carbs no extra benefit” rather than “0 carbs bad”. This distinction is pretty important for T1Ds, epileptics, etc., for example, who may only be able to minimize meds by severely limiting carbs (full time keto). Human MDR for carbs is, after all, zero. True, that does not imply that full time ketosis is ideal for everyone, or even a moderate fraction of everyone. You represent the 3 different curves as 3 different people, without getting into why. It could be 3 different genotypes. It could be 3 different epigenetic situations. It could be 3 different gut biome configurations in the same person. We might be stuck with our curve, but we can probably shove it around a bit, and might even be able to choose a different curve, too. overdose cannot be treated. Ah, choices. Pretty much all prescription drugs are poison. Even some perfectly good foods, like cows liver can be toxic if over consumed. Even oxygen is toxic in large doses as all scuba divers know. Need I mention hydrogen hydroxide? I’m wondering whether vaccinations will turn out to have a bell curve. I’m not anti-vaccination by any means, but I hear that in some areas children are getting up to 60 inoculations. Will there be a point at which vaccination produces diminishing returns and how will that negatively affect human health? What worries me is that you are not allowed to discuss concerns about vaccines without being attacked. Dr Kendrick in the UK, who regularly writes in the British Medical Journal, penned an article saying we should debate this topic (not making any positive or negative point about vaccines himself). The article is the only one he has submitted that has not been published. 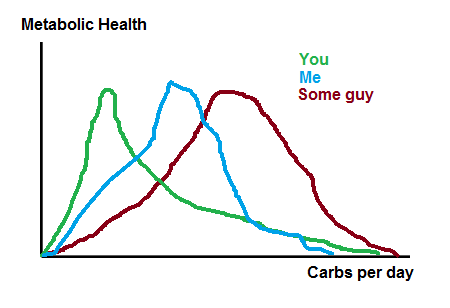 Obviously you know this Tom, but the carb curve doesn’t even begin to address where the carbs are coming from. For instance, 50 grams of bread will not have the same effect as 50 grams of, broccoli or some other real, whole food. As for me, I have no clue where my carb count lies because after losing a ton of weight on a LCHF mostly real food diet, I started adding carbs slowly without really counting them. Now, I pretty much eat whatever real food I want in whatever quantity I want, minus super starchy vegetables like potatoes (turnips are perfect for pot roast I must say). No grains and added sugar of course. Last week, I’m pretty sure I ate about 2 lbs of cherries in a single day. Not exactly super low-carb. Although there are some days where I’m sure I eat 80% or more fat with hardly any carbs. My weight won’t budge. I can’t lose or gain anymore, I just stay where my body wants. The only way I can “cut out” is if I intermittent fast but it’s just not worth it to me because I’m fairly lean now anyway. Sure, carb quality counts. But I’m convinced the “glucose deficiency” described by Paul Jaminet in the Perfect Health Diet book is a real issue for some people.